My concern would be getting across the Comox Bar - especially if you having countervailing wind and current, and a low tide. Once out on the Strait, it would be uncomfortable and no place for a small child. We are out at Comox bc and the wind is supposed to be up to 20 and possible 30 nm/h for cross the straight. I haven't sailed much in wind over 10nm I'm guessing. And today it was 10-15 and we were sailing with just the storm jib and no main. I'm wondering if any other other 26ish footers what they think is a safe to sail in. When they reef, etc. I was going to go in 20nm winds but not higher. And I was going to go with reefed main and storm jib. Sorry to disagree, but that Grampion doesn't have a full keel. The fixed-keel models had an externally attached cast-iron keel designed to be trailerable. I understand that some boats were built with centerboards as well. Wind speeds are more correctly referred to in knots, not in "nm," which stands for nautical miles. A knot is basically a nautical mile per hour. If you feel, at this point and on this boat, that you shouldn't go out in more than 20 knot winds, then don't. It would be irresponsible to go out in a breeze in which you don't feel confident. Don't let anybody tell you differently. If you ever ask yourself "Should I reef? "; the answer is "Yes." "Pick your battles and every trip should teach you something..." (Best advice on here.) Your boat should do anything you want. 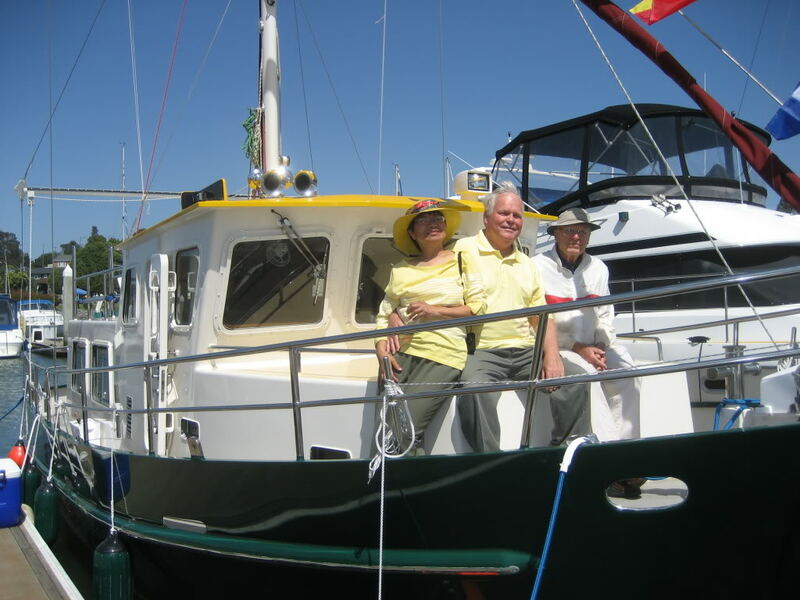 You need to get experience, and get familiar with every aspect of your boat. Know in your head where that one rusty clamp is... etc. Once you get comfortable with more and more wind and situations you will want to go out and experience 20-25 windspeed. Sail downwind for a few miles then turn around and learn how much different up wind is. learn navigation. Listen to the VHF weather forecast even if you arent going out. You will get familiar with what they REALLY mean in your area. For instance, in Puget Sound, 5-15 means you will be motoring. 10-20 means you may be reefing! etc... You will get there for sure...just pick your battles and challange yourself now and then... Good Luck! My little 28 ft full keeled cutter was no problem at 30-35 knots of wind with a double reefed main and staysail. It was fun, actually, so long as the sea state wasn't too bad. I've never sailed a Grampian, but if you can put a second reef in the main and use a storm jib, that should work. If thing get really tough, heave to. My experiences were that afternoon winds in late Spring on SF Bay were consistently stronger than during winter when drifting was a frequent game. Waves in SF and connected bays are often especially steep, particularly with ebb currents running against the prevailing wind. We've had up to 70 knots around here in the last 24 hours - Need it be said that no one is sailing? I'm with jackdale on this one... at least a couple of reefs in the main before leaving the dock... easier to shake one out than putting one in in heavy weather. 20-30 knots is no place for a small youngster when everyone on board needs to be focused on sailing the boat. Mark, perhaps you missed that the sailing I was referencing was in STORMS, not the typical mid-winter calms. The conditions were definitely a bit harsher than during typical summer sea breezes. Summer sailing on SFB is great, with consistent 20-30 kts in the slot, occasional days of 30-35, but during those winter frontal storms, winds were often 45 gusting higher, accompanied by rain and other yucky things. That's what we were trying to experience, and we found it. Again, not fun, but very educational. Worked for us. Understood. Unfortunately (? ), I've been unsuccessful in "chasing" storms as they are gone before I arrive. My grandparents are gone. Took my 92-year-old Dad on a sail after this photo was taken, but no storm! I resume this old topic, but I was sailing yesterday my Etap 30. And we had 11Knots of wind with some guts over 15knots. I had the main up and a jib storm. The problem was that the boat was bending so much that the sails were almost touching the water and several times we completely lost the control of the sailboat. Now, reading your comments it seems that 9-12 knots are nothing and sailboat even smaller than a 30 ft can easily handle a 20knots wind, but my sailboat could not be managed even at 10 knots. There are a lot of details, but make sure you are set up to reef the mainsail easily. Do it as soon as you start thinking "maybe". Sailing the boat flatter will be just as fast or faster. In gusts, release the main sheet to dump some wind. How big a jib? I'm sure you didn't translate "Storm Jib" properly. In 11-15 knots you shouldn't need to reef or anything. Not sure what's gong on there. Yesterday we raced a lighter 30 footer (Farr 1/2ton) with a much higher SA/Disp ratio than yours hard on the wind in 15-20 knots with a full main and No 2 jib quite comfortably. When it got over 20 knots, we were a bit over canvassed but we only had one short beat to windward so we feathered the main rather than reefing because we had a long downwind leg coming up. Even over 20 knots we never came close to putting the spreaders in the water or losing control. If we had been cruising, we would have had one reef in the main and probably gone down to the No 3 jib once the wind picked up. Can you get a more experienced sailor to go out with you and give you a few tips on sail trim?